Not only is labor productivity in Israel very low in comparison to the developed world, it is also very low in four of the country’s five primary business sectors. At the end of the day, one of the main goals of policy makers is to improve living standards (commonly measured by GDP per capita). Increasing economic growth in the steady state is a result of steadily improving productivity. One important measure of productivity is the average amount of GDP produced per hour worked, or what is generally referred to as labor productivity, which is also an important determinant of wages. Taub Center Executive Director Prof. Dan Ben-David explored the issue of labor productivity in a study published in the most recent State of the Nation Report 2013. The study finds that not only is labor productivity in Israel among the lowest in the developed world, but that a substantial labor productivity gap between the G7 countries and Israel has been progressively growing for over four decades. Furthermore, while average hours worked per person have decreased steadily among the G7 countries over the last thirty years, the corresponding figure for Israel has fluctuated over time but remains at a similar level today as in the early 1980s. An important contribution of Ben-David’s study is a holistic look at productivity across five business sectors that comprise a large portion of Israel’s economy. Prior to this work, it was thought that the productivity gap may be due to a bloated government bureaucracy or to individual sectors where Israel performs poorly. 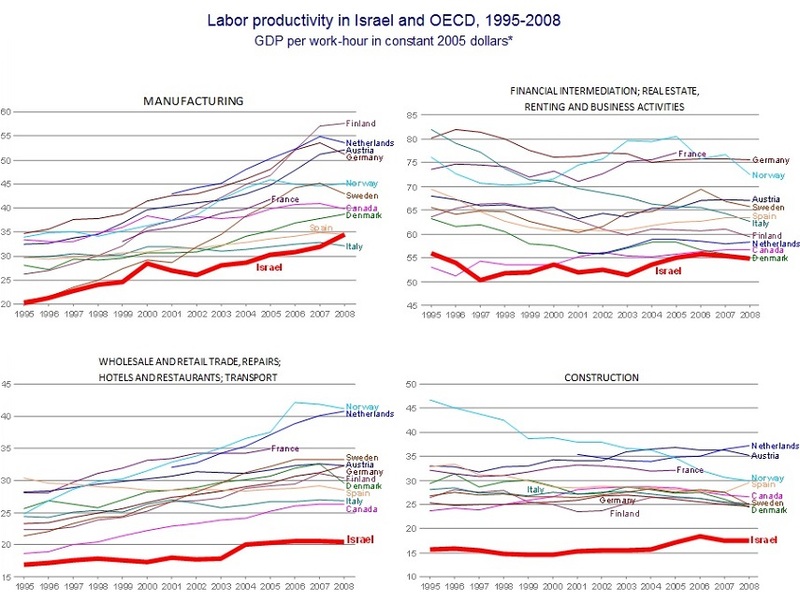 However, as the five panels of the figure indicate, labor productivity in Israel in four of the five business sectors is below all, or nearly all, eleven other developed OECD countries with relevant data since 1995. In the manufacturing sector, which includes both high tech and more traditional industry, Israel has improved from last place in 1995, to second to last place, ahead of Italy in 2008. Across countries, productivity is the highest in the financial intermediation, real estate, renting and business activities sector, relative to the four other sectors examined. In this sector, Israel has moved from second to last place in 1995, to a tie with Denmark for last place in 2008. In the sector encompassing wholesale and retail trade, repairs, hotels and restaurants, and transport, Israel has the lowest productivity throughout the entire period examined, and is falling further behind other developed countries. The construction sector, which is dominated in Israel by a large number of unskilled foreign workers, is characterized by particularly low levels of labor productivity. Throughout the period examined, Israel remained far behind the other eleven countries examined in this sector. 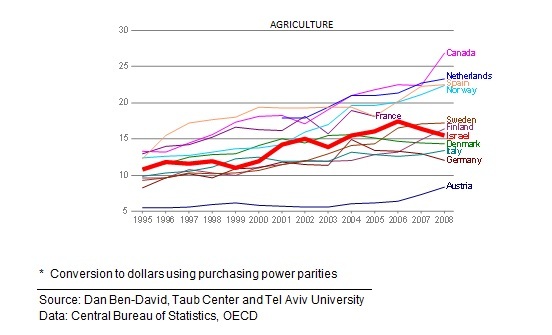 The one sector where Israel performs relatively better is agriculture, long a source of pride and innovation in the country, though Israel’s productivity in this sector has not been exceptional – remaining consistently among the middle of the eleven OECD countries examined. 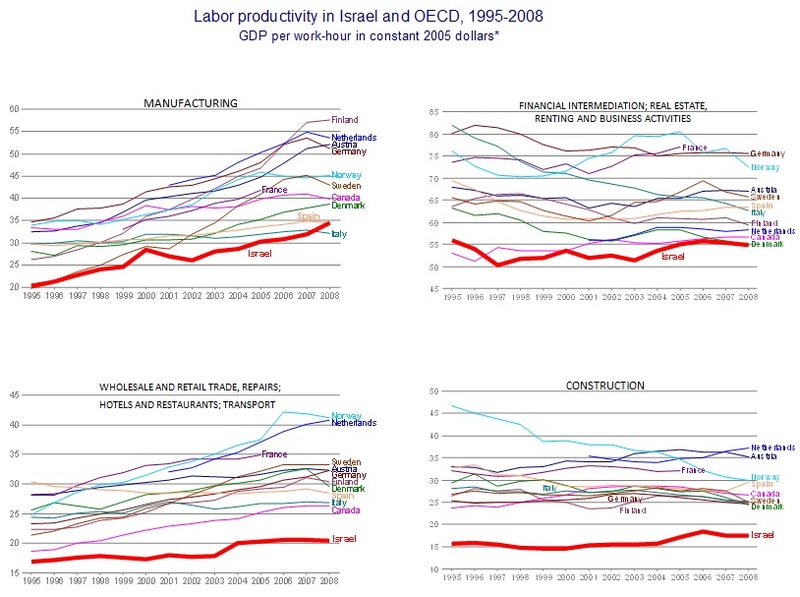 Israel’s productivity is lower than the OECD average across the board, and the gap is particularly noticeable in the wholesale and retail trade, repairs, hotels and restaurants, and transport sector as well as in the construction sector, which both have productivity almost 40 percent lower than the OECD average. Given that lower productivity is a ubiquitous phenomenon across the Israeli economy, there are clearly underlying country-wide factors that lead to such a result. As shown in the State of the Nation Report 2013, this is due to a range of underlying factors, including lack of sufficient human capital due to poor basic education in general and for ultra-Orthodox and Arab Israeli students in particular. Low investment in physical capital over the years and a cumbersome government bureaucracy make it more difficult to conduct business efficiently in the country. Productivity is intimately tied with higher standards of living. Thus, addressing the barriers to increased productivity is key towards improving the everyday life of Israelis.